While there is trash on land to pick-up, there is trash in our water ways that needs the attention. Plastic bottle, cigarette buds, and even tires flow along the water ways and into the ocean. Well in Baltimore, John Kellett decided to take action and clean up their ports and water ways by creating a water wheel at the end of Jones Falls River. It is solar- and hydro-powered, which promotes cleaner energy for a cleaner cause. 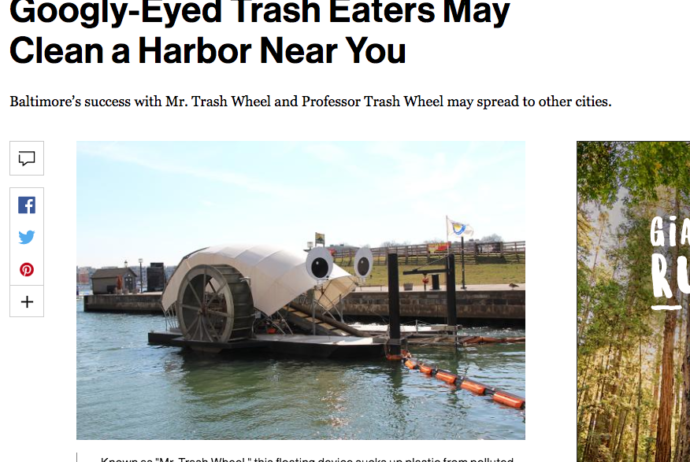 Not only did it collect thousands of pounds of trash from the water way, but the public supports it to the point where John Kellett was able to create a second wheel. I also found a video from NBC News about the water wheel that I suggest you should check it out.